It’s widely stated that compressed air is the fourth utility, an essential component in the running of many successful industrial settings. As such, thousands of industrial business owners set out to invest in a compressed air system every year. However, some of these buyers neglect to do any preliminary research before shopping around, beyond looking at industrial air compressors on the internet. While shopping around is a vital part of the compressor buying process, it isn’t a purely external process – you also need to consider your own needs. No two factories are the same, each governed by a unique set of circumstances that make their compressed air needs different. For example, a factory making use of the occasional air tool for assembly purposes is going to have very different requirements to a food factory with a production line that runs all day. Similarly, different compressed air systems are suited to to different applications. Knowing which is right for you can save you a lot of money in initial costs, as well as long term savings made via improved efficiency and reduced energy costs. In order to get a rough idea of your requirements, you need to think about four key areas; air quality, air quantity, pressure and demand. Determining how clean and dry the air you’re going to be using needs to be is dependent on the applications for which you will be using your compressor – an air compressor in a food setting, for example, will need to output pristine air free from contaminants in order to meet strict guidelines – and will determine how much you spend on air filtration systems, as well as helping you decide between investing in an oil or oil-free compressor. 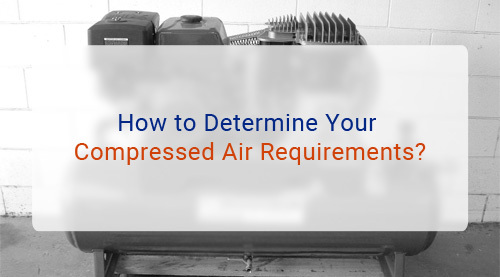 Determining air quantity is as simple as determining how much air you’re going to need to keep your operation ticking over. To do this, figure out how much air each of the tools and processes powered by your system is going to use and for how long. Then take the average figure of each process and add them together for your average air quantity requirements. To decide how much pressure you’re going to require, you need to figure out a minimum discharge pressure level. This figure can be reached by taking into the account the various pressure requirements of the applications for which you’ll be using your compressed air system. You will also need to take into account pressure drops which can occur over the journey of air through the system to the eventual end use point. Unless you work in a small, single purpose factory, the chances are you will be using your compressed air system for a wide range of applications. As such, you will need to account for these fluctuations in demand when buying an air compressor. If there is a relatively small difference in demand between applications then you may be able to get away with a single system. For a wide range of demand requirements, however, then you’ll need to find a system that can operate under part load or even consider investing in two systems – used compressors can offer an economically viable option if you do need to take this route. Once you have determined all of these factors, you can begin designing a compressed air system tailored for your business. For all the compressors and components you’ll need to do this.